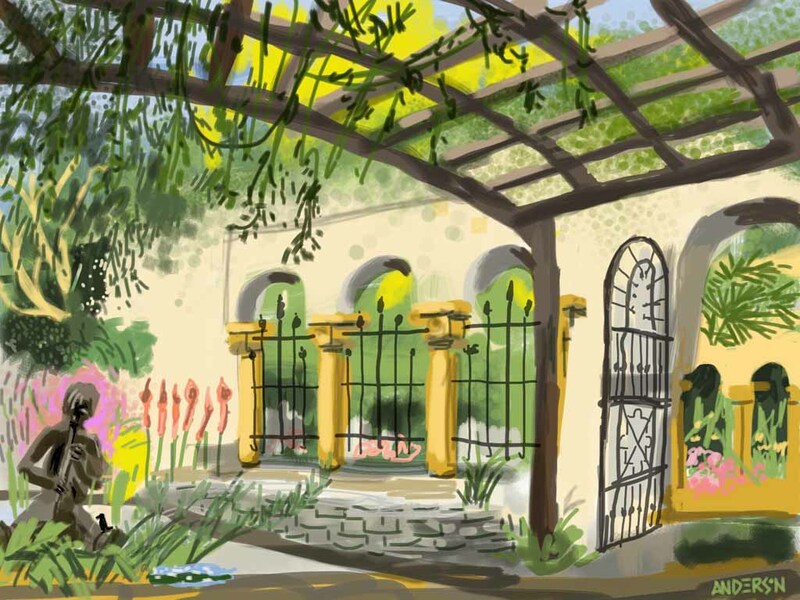 Despite the holiday rush I knew I just had to make some time to do some sketching when I saw that the St. Louis Drawing & Painting Meetup group was headed to the Temperate House at the Missouri Botanical Garden this past Saturday afternoon. It was chilly outdoors but very comfortable inside the glass covered space that is filled with fountains, climbing green vines, palmettos, giant jade trees, ripe oranges hanging from tree branches and flowering plants of all types set within a classical garden that could easily be a set for a Shakesperean play. Fellow sketcher Brian Anderson organized the event and was on hand to snap photos of the happy artists having a great time. He was kind enough to post this one of me drawing with a Nomad brush on iPad. 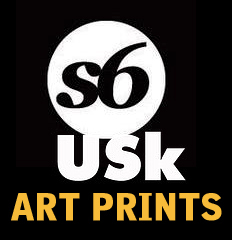 Happy holidays and best wishes to all my USK Midwest friends! 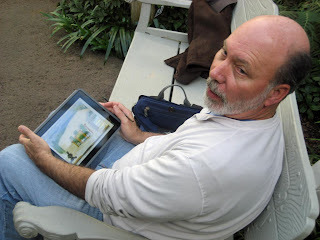 Classical Garden, Temperate House, 12/22/2012, Michael Anderson, Brushes3 for iPad. We hardly ever go out to eat. Having food delivered from Great Wall Chinese restaurant is a treat, a welcome break from cooking. 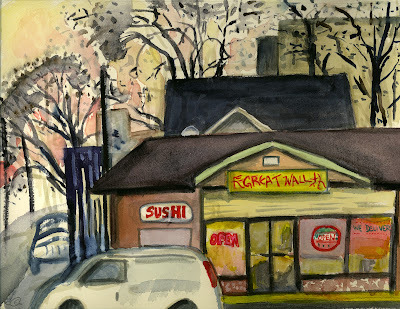 I did this watercolor November 2011, on a cold, late afternoon from the car. Not a great sketch, or my local restaurant, but a great story. While on vacation in Charleston, SC Jestine's Kitchen was recommended to us. 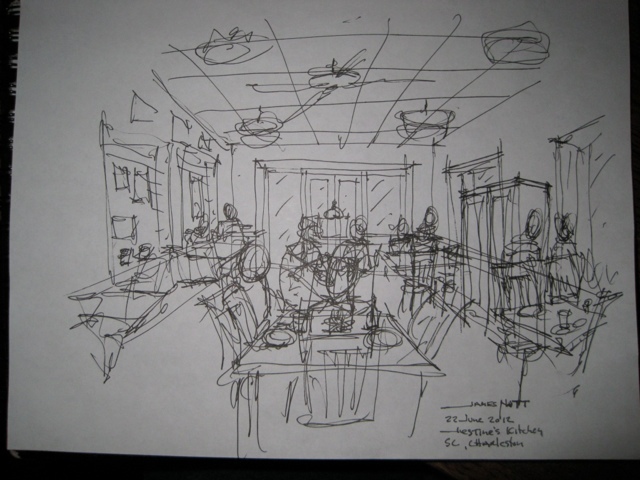 Awesome food and I did this super quick sketch. The owner liked it so much she literally put it on the refrigerator and promised to frame it for the hall of fame wall in the restroom. So if anyone visits Charleston, this place is awesome if you like soul food ( and I do) let me know if my sketch made the Men's room! It was all decked out for Christmas, but then it ALWAYS looks festive. 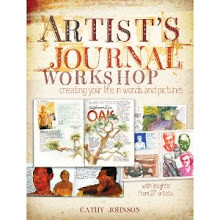 Anybody interested in a "scavenger hunt" virtual sketchcrawl? 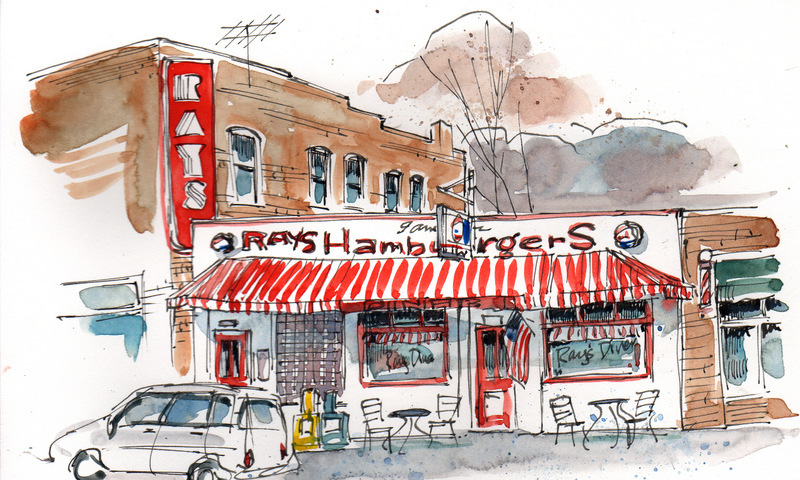 We didn't get to meet up this month, so how about sketching your favorite diner/restaurant/cafe and sharing it here?? There's more on our parent blog about the why and how of this sketch, inspired by David Gentleman's new book, London, You're Beautiful! family Christmas dinner, a photo by vickylw on Flickr. The Williamson family gets together each December for a Christmas dinner, normally at a home. This year it was Elaine's turn but her house is in a bit of chaos -- so she hosted all of us at her favorite restaurant. It was lovely seeing everyone (we had an upstairs room all to ourselves) but Bill and I really don't like their food. The two musicians were good though. I've been up north at a professional ski instructors clinic since the tail end of last week. Before I went north though I was back at Kalamazoo's Air Zoo for another morning of sketching. 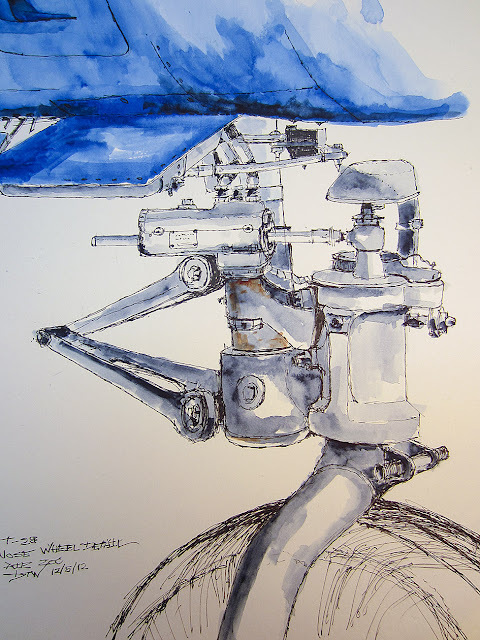 This is nose wheel detail of a Navy T-28 that the museum has in its collection. The T-28 was a trainer for the Navy as well as being used by the other services for similar purposes. The plane is large and though I titled this post "Drawing Exercise" it was fun and challenging to work up this sketch. Lots of details with connectors, bolts, pumps, etc. in the nose wheel. The work also jogged memories of the short period of time after I was commissioned in the Air Force that I served as an aircraft maintenance officer. Good memories! 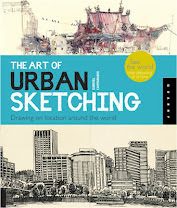 Going to the Urban Sketchers Symposium in 2013? I have meetings in Philly all the time, but just at the beautiful Naval Yards in the incredible Urban Outfitter's offices (by the architecture firm of MS&R - I used to work there but before these projects). 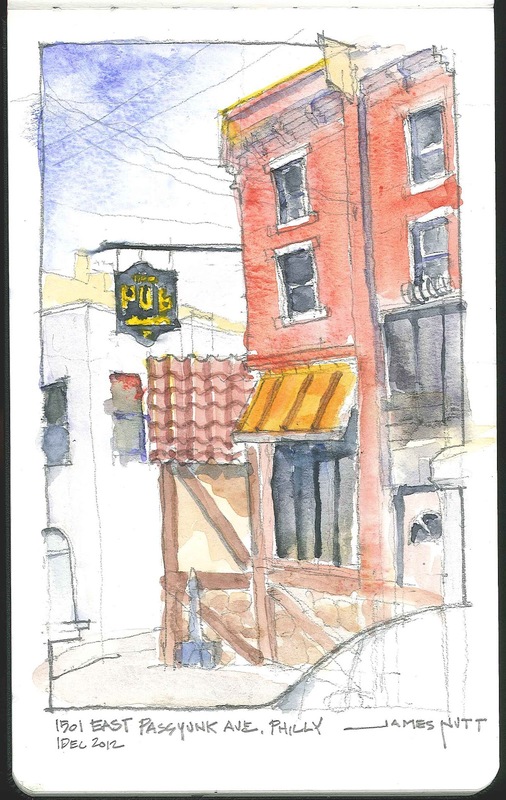 I never get to see the city, but this time I had Friday meetings and I scheduled my flight to leave Saturday evening so I would have a full day in Philly to sketch. Co Workers took me out for a vintage South Philly night (and it was trully vintage) and gave me places to go and see. This is the best of the bunch and where we started the evening. You can see the rest and some progress shots at my blog. Sixteen artists were invited by Art Saint Louis and the St. Louis Symphony to sketch the orchestra in rehearsal on Thursday morning. Artists were requested to limit their media to small sketchbooks & ball point pens and to minimize pen stroke & page turning noises so not to distract the orchestra during their performance of a challenging program titled Heroic Strauss. I compressed the stage proscenium perspective in order to make it fit within the real estate of my sketchbook page. SLSO Rehearsal, 11/29/2012; Michael Anderson, Precise V7 Rolling Ball, Moleskine watercolor sketchbook, 5” x 16”.